Features: A larger and more robust metal construction and superior optics compared with a toy. Light is shone through subject and prepared thin specimens are needed. Magnifications are typically 50 - 400X. Inverted two dimensional image with shallow depth of field. Often modular construction - additional eyepieces, objectives etc available. 1) Eyepiece, more than one may be supplied eg 7X, 15X to give a range of magnifications with the objectives. (Total Magnification = eyepiece x objective magnifications). 3) Fine focusing knob to finely adjust the focus at higher magnifications. Cheaper or simpler microscopes may not have this, which is fine for modest magnifications eg up to 300X. 4) Three objectives on a rotating turret, can with the eyepieces give a range of magnifications typically from 50X to 300X. The simplest microscopes may not have a turret and objectives have to be replaced by unscrewing, this is less convenient. 5) Stage with a hole to let light through. The clips hold the glass slide on which the specimen is mounted. Under the stage may be a device for controlling light for each objective ie. either holes on a rotating disc, a diaphragm or an optical device called a condenser depending on cost. 6) External lighting is required to reflect light up through the stage, either daylight (not direct sun) or a lamp. The mirror is usually two sided, a flat face for higher powers and a concave mirror for lower powers. A low wattage desk lamp with a large pearl bulb is fine for simple work. Guide price: 60 - 150+ UK pounds depending on maker and specification. Note that the design above is a more traditional style. 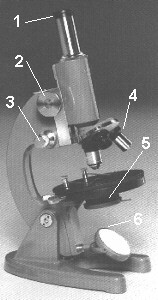 There are modern designs with an angular construction but which share the basic features of the compound microscope above. They often differ in that the stage moves when focusing rather than the limb. This feature is particularly of benefit if photography or video microscopy is to be carried out. More expensive compound microscopes of this design have illumination built in, which may vary from a cheap tungsten bulb and ground glass screen to the more expensive quartz halogen lighting. These designs also offer binocular heads where the eye sees the same view which is more comfortable for extended viewing. (Note: a binocular head on a compound microscope differs from a stereo microscope where each eye sees a different view to create a three dimensional image). The author Dave Walker would welcome comments on how this advice page can be improved, the opinions are those of the author.